This month, through Amanda's (Amanda's Cookin') brainchild - SRC, I had the opportunity of getting to know Rebecca of A Dusting of Sugar. As soon as I ran over to check out options for SRC, I saw her post on Chocolate Chips Banana Bread Scones. I've been meaning to try making scones for a while now, and this seemed like the perfect opportunity. Also, my options this month were rather restricted, since I'm abstaining from meat, fish and eggs this Lent. I was thrilled that such a yummy sounding treat was an eggless one. When I made these scones, I was in for a real treat. They were moist and had some yummy, gooey, melted chocolate goodness ever so often. The original recipe included a glaze, but these were so yummy that we had them straight, without the glaze. I made a few minor changes to the recipe and my version is noted below. You can visit A Dusting of Sugar for the original one. Thanks Rebecca, for introducing me to something so simple, yet absolutely delicious. I'm making another batch of these scones this evening. Mash the bananas in a bowl. Add the milk, vanilla extract and yogurt. Mix well and keep aside. In a large bowl, sift the dry ingredients, the flour and baking sugar and add the sugar and mix well. Rub in the cubes of cold butter till the mix resembles coarse wet sand. Pour the banana mix into the dry ingredients and stir well until just thoroughly incorporated. Fold in the chocolate chips, making sure they are distributed throughout the batter. Tip the batter onto some plastic wrap. Flatten it to a disc about an inch thick and freeze for 30 minutes. Place the cooled disc onto a baking sheet that has been lined with some greased baking paper and cut into 8 equal wedges. Don't forget to check what the other members of Group B have whipped up. Thanks Suzanne for hosting our group. These sound amazing. Good pick! Delicious and yummy looking scones. These look great! I love the banana/chocolate combo! One of my favorites! I have yet to make scones! These sound great and I'm sure the kids would love them! They were a complete hit with the adults too! I'm sure kids will enjoy them! Yay, I'm glad you liked them and found something you could make during Lent! Trisha, I had your blog this month and was more than impressed! Your recipes rock. There are so many of them that I want to try! Thanks Vivian, I hope you enjoy them! Love scones, love banana bread. Must try these! Great choice and I'm glad you were able to find something that fit into your parameters. Me too ... and something this lovely. Thanks for stopping by Danielle! Mmm, I love scones, but had not thought of banana for them--which is odd because I love all things banana! Love that they are made with healthy yogurt instead of scones traditional cream. Gonna have to try these! I hope you enjoy these as much as we did Katrina! Oh golly! i have pinned this recipe for future use :) Thank you for such an awesome post! Anytime Angie, glad you like it! 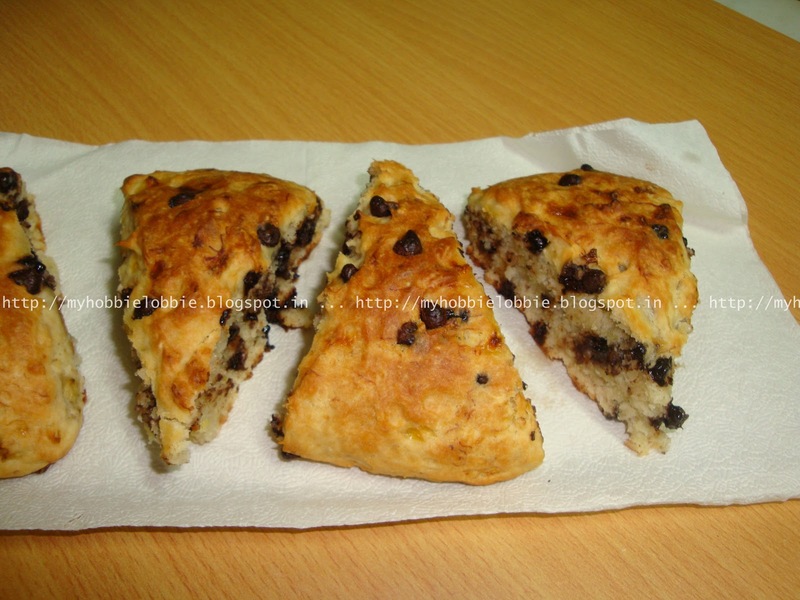 I just love scones and this recipe looks delicious, I would really enjoy it. It is fun cooking with you here at the SRC and have a great week! I adore the bananas and chocolate together, great sounding recipe. You combined so many wonderful things together. Banana bread, scones, chocolate.. wow. They look great! What are you eating on Friday's if you're not eating fish? Love the combination of chocolate and bananas, classic! I love freshly baked scones,a real English recipe. Not had this's one before but it s a nice ingrediant to add ,so should be very tasty. A nice treat for anytime of the day. I think you mean ripe bananas, not rice bananas?